Stealthy Mom: Mopping the Floor to Cure a Headache? Mopping the Floor to Cure a Headache? There are days when the boys are louder than others, whether it is amicable role play or a brotherly squabble. The cats hiss at each other and the dog barks at them, then at the UPS guy, then at the mail lady... Oh, my aching head! If only I could just turn down the volume a bit in the whole house. I have a secret weapon that I bring out from time to time. Two, actually: essential oils of peppermint and cedarwood. These two oils, in a 2-to-1 ratio peppermint to cedar, when added to unscented* mop water, take everything down a notch. I choose to use the mop water as the medium because it will give a gentle scent to much of our home, but not in an overwhelming way. It does its job and within a few hours will be gone. Today I used six drops of peppermint and three drops of cedarwood, making it pretty strong while keeping the ratio at 2-to-1. Peppermint has an immediate cooling effect, and its vapours relieve my tension headaches. (If it is a migraine, the effect will be temporary but welcome all the same.) When I was a kid my mom used to rub white Tiger balm on my temples for a headache and this works in a similar, but more subtle, way. 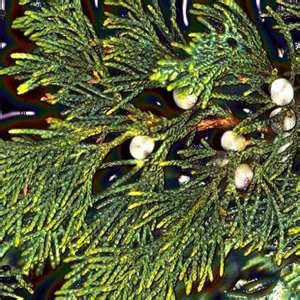 Cedarwood gives a clean, earthy under-note. It is purported to have a calming effect. The household seems to quiet down after everyone gets a whiff of the magic mopping potion. Perhaps it is my imagination; maybe it is because my head stops hurting and I feel better. I don't know, but it works for me. Headache gone. Floors clean. Next? * It is hard to find a good, all-purpose cleaner that is not heavily scented. Life Tree's Home Soap does the trick for me. It barely has a fragrance of its own so I can add whatever I like or just let clean smell like nothing. I shared this post with Frugal Days, Sustainable Ways, Wildcrafting Wednesday and Fight Back Friday, the Weekend Whatever and Small Footprint Fridays. Tiger balm on the temples... WOW! I can see why it works, but... At any rate, I'll be trying this in my home soon! Thanks (poppin' in from weekend whatever link up). Oh, yeah white Tiger Balm is great for headaches. It stinks, though, and once it is slathered on the side of your head you are committed to it. What a great idea! Cedarwood is so lovely too! Readers think your post is great too, because you've been featured at Small Footprint Fridays this week! I hope you'll link up again tonight!